This was a challenge to abortion survivors. Young people of this country who were born after Roe vs. Wade have only known a society that sanctions the killing of unborn babies. This was a challenge for those who have lost 1/3 of their generation. 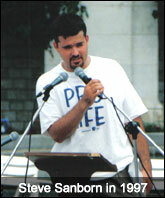 In 1995, a group of students from Franciscan University of Steubenville answered the Holy Father’s challenge by organizing a Pro-Life walk across America that summer. They relied on God’s providence and with faith in the kindness and generosity of fellow Americans who share the same desire to help the Culture of Life take root in America. Their main mission as they walked was to offer up all of their prayers and sacrifices for an end to abortion and an end to the Culture of Death and to promote the dignity and sanctity of all human life throughout the cities and towns they visited. The group started walking from San Francisco, California with very little money but armed with prayer and the desire to save lives and convert hearts. The walkers offered up all of their prayers and sacrifices for an end to abortion and an end to the Culture of Death throughout the entire summer. The walk was difficult but the walkers persevered and were able to cover the entire 3,200 miles from California to Washington, DC in just 11 weeks. That summer the walkers discovered that America is truly pro-life. People in every city and town they walked through were overwhelming supportive of their mission. Also, the walkers encountered many women who have had abortions and are living with the pain and torment that comes with having made that “choice”. They were able to pray for healing for these women and their families and to direct them to places where they could find help. Who: Primarily college-age students. Men and women, who are 18 or older, from colleges and universities across the United States are welcome to participate. What: Three summer walks across America that are over 3,000 miles each. Besides walking for the unborn, walkers educate the youth of America about the Pro-Life movement through conferences, talks, radio, TV, and newspapers.When: Every summer, from late May through mid-August. Where: Three walks, originating from Seattle, San Francisco and Los Angeles, all ending at the U.S. Capitol building in Washington, D.C.
Why: To witness to the dignity and sanctity of every human life, especially the unborn. Crossroads is a peaceful organization dedicated to help bring about a Culture of Life in America. By the time the first group of walkers made their way to Washington, DC, they had talked to over 100,000 people, peacefully prayed and protested in front of over 20 abortion clinics, spoke in over 40 parishes, and gave countless interviews with newspapers and radio stations. People everywhere were simply amazed to see that there were young people willing to give up their summer to take a three-thousand mile trek across the country in defense of the sanctity and dignity of all human life. The last day of the walk the group held a rally on the steps of the U.S. Capitol building in Washington, DC. They wanted to tell their government and fellow Americans that the youth of America were taking a stand for those who are not able to defend themselves. Each summer people they encountner are encouraged to see that there are young people willing to give up their summer to take a three-thousand mile trek across the country in defense of the sanctity and dignity of all human life. Crossroads has been called one of the most successful and vital organizations in the Pro-Life movement by other Pro-Life leaders, including Blessed Theresa of Calcutta, who wrote the walkers a letter praising them for their efforts in the defense of the unborn. That first summer and every summer since, Crossroads walkers have witnessed to millions of people, mainly one on one in the streets, and have been able to continue their mission of saving lives and changing hearts. Over 1,000 college-age young people have walked on Crossroads since 1995 and more and more people are deciding to walk to answer the call to defend life each year. Crossroads has been featured on national news networks as well as on EWTN’s Life on the Rock. The question to you is: Are you ready for the challenge? Are you ready to follow the Holy Father’s call to help build a Culture of Life in America?